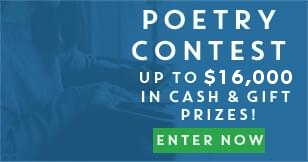 Spread the Word to Join Poetry Nation Today! Spotlight on Forms: What is Spoken Word? Poetry Quiz! Can You Match the Famous Poet to the Last Line of the Poem? Spotlight on Forms: What is an Ode? Rhyme and Rhythm: Do they Matter in Poetry? Spotlight on Forms: What is a Limerick? Poetry Quiz! Can You Name the Literary Device? Spotlight on Forms: What is a Haiku? Spotlight on Forms: What is Prose Poetry? Poetry Quiz! Can You Match these Famous First Lines to the Poem? Spotlight on Forms: What is a Sonnet?